he one thing you will never see at the Frederick Historic Piano Collection in Ashburnham, Mass., is a sign that reads, "Do Not Touch." Unlike most museums, this important collection of historic 19th-century pianos is meant to be used. 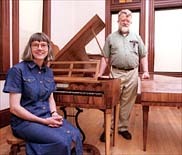 Its owners and directors are a married couple with a mission: Edmund Michael Frederick, a former East Asian history major and harpsichord builder and an amateur performer, and Patricia Humphrey Frederick, a specialist in elementary music education, church organist and choir director. They purchased their first instrument in 1976: a Stodart built in London about 1830 that cost them just over $2,000, with an additional $1,000 for air freight, that required extensive restoration upon arrival. Leipzig, a typically warm-toned German piano, though Debussy acquired one in 1904 and loved it. estimate: it's like setting a price on antiques. But Mr. Frederick pits it at roughly $400,000. supported by some crucial grants, including one from the Massachusetts State Historical Commission. could only fit when kept on their sides. This nonprofit institution is intended as a resource for pianists, scholars, students and the curious. was shoehorned into their home. The couple also present concert series, but for these performances the desired piano is moved to the nearby Community Church, a commodious space that can seat 200. The nominal admission fee is $5 (free to students and children). The fall season ended on Oct. 21 with Susan Alexander-Max playing works by Mozart, Haydn, Johann Christian Bach, C. P. E. Bach and Clementi on a Clementi piano from 1806. The concerts resume in May. Familiarity with 19th-century pianos is critical to interpretating piano music of that era. It is widely assumed that once the precursors to modern concert grand pianos were built, during the 1820's, pianos just got progressively bigger, louder and more efficient. This, Mr. Frederick asserts, is a misconception. "People have this idea of a simple linear development from Cristofori to Steinway," he said. "In fact it wasn't that neat. What went on was all sorts of pianos of different kinds and qualities were being made and used at the same time." The strength of the Frederick collection is its comprehensiveness. 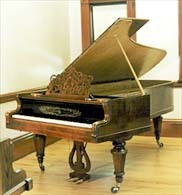 A pianist hoping to make a recording on, say, a Broadwood, from a mid- 19th-century London manufacturer, might find one somewhere preferable to the 1871 Broadwood at the Frederick collection. But few other places offer such a range of 19th- century instruments in one inviting room, which is why musicians and scholars from around the world regularly trek to this bucolic town. The best way to appreciate the collection is to sit down at the pianos and play them. Last summer, armed with a stack of scores from Haydn to Ravel, I did just that. And for another point of view I brought along my former piano teacher, Donald Currier, professor emeritus at the Yale School of Music. Mr. Frederick usually suggests that visitors start with the newest and work back. So he first directed us to that elegant, restored 1907 mahogany Blüthner, which he acquired, in pretty unplayable condition, for just $2,500 from a Dutch dealer. Mr. Currier began by playing Debussy's "Soirée dans Grenade" from "Estampes" (1903). In this slinky, slow and exotic music, the sound of the Blüthner was aptly rich and warm, perhaps a little woofy in comparison with bright modern Steinways, but quite alluring. The repeated midrange C-sharps that gently suggest a habanera rhythm came through with seductive presence. Most striking was the way the slightest pressure from Mr. Currier's fingers caused the insinuating melody in the left hand to ring out with haunting effect. He next played a late Brahms work, the wistful Intermezzo in A, Op. 118, on the same piano, and again, though the overall sound was somewhat buzzy, the piano had an remarkably lingering tone. Brahms's harmonies blended in bracing ways, with dissonant notes bumping up against one another and tweaking the music. The piano, it must be remembered, is a percussion instrument. So once a tone is struck, it starts to die away. "If you want lingering tone," Mr. Frederick said, "try the 1877 Bösendorfer." Mr. Currier did, playing the Brahms again, and indeed the thick, smoky tone just quivered in the air. Mr. Currier was curious about an 1846 Streicher, a Viennese piano that Schumann and the young Brahms would have known. He played some of Schumann's dreamy "Kinderscenen" and then parts of that composer's rhapsodic "Kreisleriana." The sound was bright, piercing and clear. "Maybe too clear," Mr. Currier said, as he struggled to keep inner voices from sticking out. Yet the metallic brightness of the sound was somehow soft spoken, making Schumann's remembrances of childhood at once impish and tender. The Streicher's special strength, Ms. Frederick suggested, is as an instrument for accompanying singers. To demonstrate, she both sang and played Schumann's "Widmung." Sure enough, no matter how much body she brought to the restless accompaniment patterns, the clear sound was so distinct that it never covered her voice. Matters of tempo in 19th-century piano music are heated topics among those who visit the collection. The metronome markings in Beethoven, Schumann and other 19th-century composers tend to be on the fast side. Could the metronomes back then have been faulty? Some scholars think so. Not Mr. Frederick. When Clara Schumann went back to work as a concert pianist after her husband died in 1856, she got some "very bad reviews for playing too fast," Mr. Frederick said. "If these were Robert's tempos, the critics said, then there must have been something wrong with his metronome. Nothing was wrong. What had happened was that the sound of pianos in the 1850's had gotten noticeably thicker. So tempos that sounded reasonable in 1835 sounded rushed and blurry 20 years later." To drive home this point Ms. Frederick played a piece from Czerny's "School of Velocity," a volume of technical studies still used today, on a Viennese piano, a Katholnig, most likely from about 1810. She took it at Czerny's seemingly reckless metronome marking. The Katholnig has an extremely light keyboard action and a slightly clattery but shimmering sound. Played at that tempo on a modern Steinway the music would have been a blurry mess. On the Viennese instrument it sounded fleet and clear, a whirlwind of runs and misty harmonies. Mr. Currier was eager to try a Haydn sonata on an 1806 Clementi piano from London. When Haydn visited London in the mid-1790's, he was struck by the big lush bass sound and dry middle register of local pianos. "That's why the `London' sonatas have so many thick, forte chords in the lower range, and so many doubled lines in thirds and octaves in the upper range," Mr. Frederick said. Mr. Currier played the two-movement Haydn Sonata No. 48 in C, with its slow opening Andante (a long- spun melody keeps returning with increasingly elaborate ornamentation) and rollicking rondo finale. As he played, every little melodic and ornamental gesture came out vividly, with no sense of forcing. The left hand chords became a harmonic bedrock of wonderfully buzzy sound reminiscent of an enormous harpsichord. Mr. Currier, who has spent many years trying to figure out how to play such music on a modern piano, was elated. "That's the sound you want," he said. "It's easy. For once you don't have to tiptoe through the piece." Haydn wrote contentedly for the pianos of his day. But what about Beethoven, a thumper of a virtuoso, famous for busting strings when he performed his works on the pianos at his disposal? Beethoven complained constantly about the inadequacy of keyboard instruments. True, he complained about everything. But the hard-driving "Appassionata" would seem to have been conceived for a piano of the future. And yet some things in the Beethoven sonatas are virtually impossible to play on modern grands with their heavy actions, for example the glissando octaves in the climactic coda of the "Waldstein" Sonata. Holding your thumb and pinky at an octave's distance in each hand, you must slide up and down the white keys. In concert Rudolf Serkin used to wet his fingers in his mouth discreetly as the passage approached to ease it along. I tried playing that passage on the Katholnig, with its light action and quick response, and it was almost easy. Slide up, slide down; just like Chico Marx. But what about, say, the late "Hammerklavier" Sonata. Even a steely modern Steinway can barely stand up to the demands of this monumental music, with its pummeling chords, gnashing trills and hellbent final fugue. I played the bracing chordal opening theme on an 1828 Graf, a renowned Viennese company. It was like using a kiddie piano for an adult job. Mr. Frederick was quick to point out that each piano from that era was valued for its individual qualities. The ideal of a standardized piano with perfect evenness throughout its range came with the late industrial age, he said. As he and Ms. Frederick write in an essay about their collection, "Pianos built before the 20th century frequently displayed intentionally wide ranges of tone color." So Beethoven used to advantage certain aspects of the pianos he had at hand and looked beyond the qualities he found deficient. At the Frederick collection, through its concerts, workshops and lecture-recitals, you can hear virtually every type of piano Beethoven would have played. Better yet, play them yourself. That's the whole idea.